Mummies of humans and other animals have been found on every continent, both as a result of natural preservation through unique climatic conditions, and as intentionally preserved corpses for religious or cultural purposes. In addition to the well-known mummies of Ancient Egypt, deliberate mummification was a feature of several ancient cultures in areas of South America and Asia, as well as numerous other. Here we feature ten unique mummy discoveries from around the world. His little face still stares upwards, as if eternally waiting for his mother. From the moment he was discovered, the little Inuit baby captured hearts with his photograph plastered on magazines and news stories around the world. When he was first found, he was believed to be a doll, but it was soon discovered that it was actually the body of a six-month old baby boy. He was buried alive with his already dead mother – presumably because there was no one left to care for him. The small Inuit baby was found along with a two-year-old boy, and six women of various ages, who were buried in two separate graves protected by a rock that overhung a shallow cave. 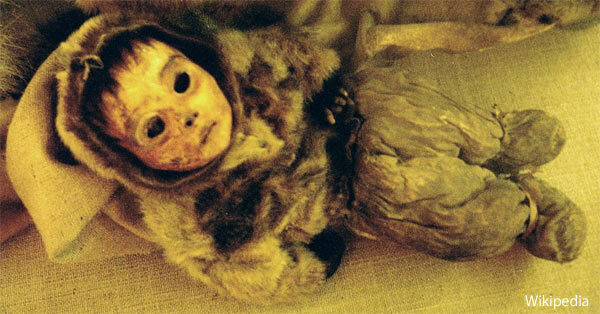 The bodies were naturally mummified by the sub-zero temperatures and dry, dehydrating winds, providing a remarkable opportunity to learn about the Greenland Inuit of half a millennium ago – they are the oldest preserved remains ever to be found there. When talking about body preservation and mummies, people all over the world think of Egypt and the mummified bodies of Pharaohs, such as Tutankhamun. But how many know that the world’s best preserved bodies actually come from China? 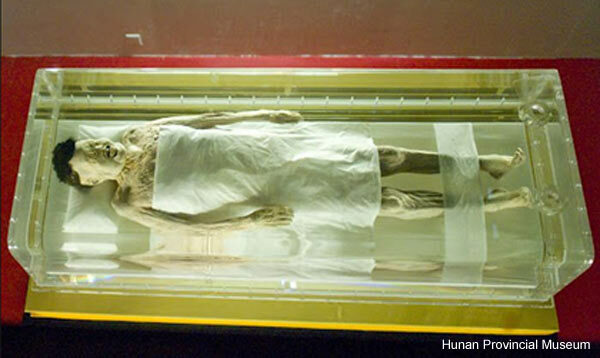 The Lady of Dai, otherwise known as The Diva Mummy, is a 2,100-year-old mummy from the Western Han Dynasty and the best preserved ancient human ever found. Just how this incredible level of preservation was accomplished has baffled and amazed scientists around the world. Xin Zhui, the Lady of Dai, died between 178 and 145 BC, at around 50 years of age. The objects inside her tomb indicated a woman of wealth and importance, and one who enjoyed the good things in life. 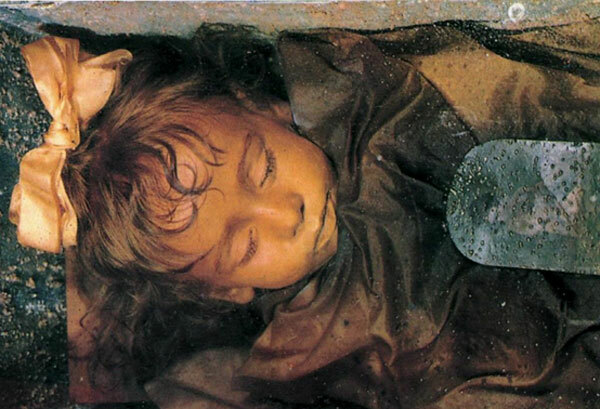 But it was not the precious goods and fine fabrics that immediately caught the attention of archaeologists, rather it was the extraordinarily well-preserved state of her remains that captured their eyes. Over a decade ago, the remains of three Incan children were found, remarkably preserved, atop the summit of Volcan Llullaillaco in Argentina. Last year, an analysis on the bodies of the 13-year-old ‘Maiden’ and her 4- to 5-year-old companions, Llullaillaco Boy and Lightening Girl, revealed that the children had been drugged and given alcohol on a regular basis as part of a year-long series of ceremonial processes leading up to their final sacrifice. Evidence suggests the sacrificial ceremony may have been used as a form of social control. Being selected for the ritual was supposed to be seen as a great honour, but it probably produced a climate of fear. In fact, it was a major offense for parents to show any sadness after giving up their children for the ceremony. Tjayasetimu is the name of a little girl who was a star singer in ancient Egypt. Nearly three thousand years ago, she was a member of the royal choir and sang for the pharaohs in temples on the Nile. The seven-year-old girl, although heartbreakingly young when she died, was important enough to merit an elaborate mummification, a process normally reserved for Egyptian royalty and elite families. Tjayasetimu had been wrapped in painted bandages, her face covered with a delicate veil and hidden by a golden mask, and she had been placed in a gilded sarcophagus. The child star was well-preserved and still had a full head of shoulder-length hair. They could even see her milk teeth pushing up through her gums. At a height of just 4 feet, Tjayasetimu was far too small for her sarcophagus, although it is not clear why a casing was not made to fit her size. Scientists believe she died as a result of a short illness, such as cholera. Loulan was discovered in 1980, but it was 3800 years ago that she died on the trade route known as the Silk Road. The natural dryness and salty soil preserved her and over two hundred other mummies, individuals who had lived in several closely located settlements along the trade route. The mummy has been called the Loulan Beauty because of her amazingly preserved stately facial features that have remained quite beautiful even in death. Unfortunately, the region where she and the others were found is politically unstable and the discovery of the mummies in the Tarim Basin in China was seen as a possible instigating factor for unrest. The Chinese government has been reluctant to allow full access to the mummies because of their racial identity. 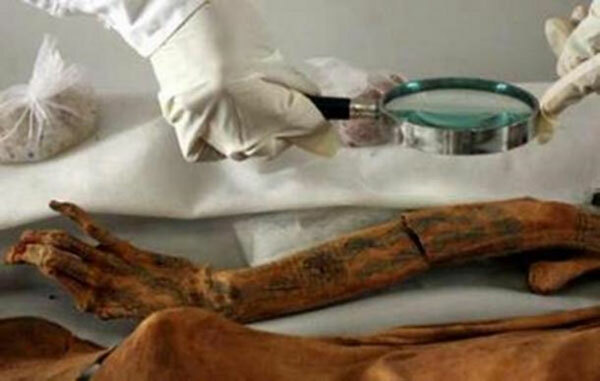 The Tarim mummies are Caucasian and this fact has given credence to the claims of the local peoples, the Uyghur, who look more European than Asian that they are the descendants of the original inhabitants of the area and not later arrivals, as Chinese history claims. Ötzi the iceman, who was discovered by some German tourists in the Alps in 1991, was originally believed to be the frozen corpse of a mountaineer or soldier who died during World War I. 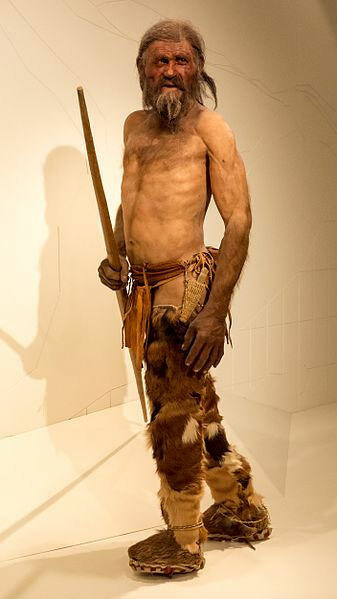 Tests later confirmed the iceman dates back to 3,300 BC and most likely died from a blow to the back of the head. He is Europe's oldest natural human mummy and, remarkably, his body contained the still intact blood cells, which resembled a modern sample of blood. They are the oldest blood cells ever identified. His body was so well-preserved that scientists were even able to determine that his last meal was red deer and herb bread, eaten with wheat bran, roots and fruit. On the beautiful northern coastline of Peru overlooking the blue Pacific, the place known as Huaca El Brujo (Sacred place of the Wizard) gives us an incredible glimpse into the culture of the Moche and the ‘Wizard’ buried there. Its two main pyramids, Huaca del Sol and the Huaca de la Luna, were once the centre of social and religious functions in the area and the final resting place of the tattooed mummy, who has come to be known as the Lady of Cao. Not an elderly woman, she died in her mid-twenties about fifteen hundred years ago, probably as a complication of childbirth. 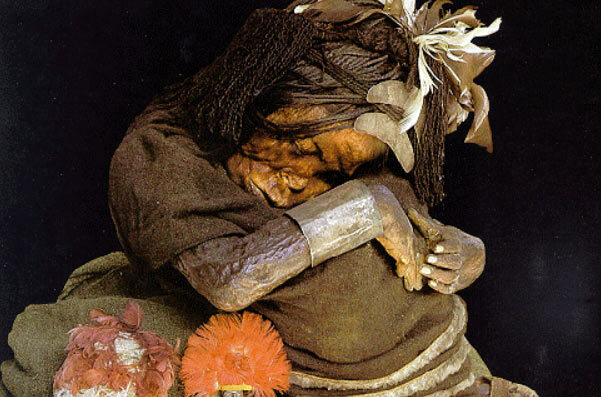 The Moche did not mummify their dead purposefully, but the conditions for desiccation just happened to preserve the Lady of Cao and by doing so also preserved her intricate tattoos. Although it is not believed that the more common members of Moche society were tattooed it could certainly be inferred from this burial that the highest status members were, and the tattoos probably represented and strengthened the individuals’ connection with the divine through sympathetic magic. Zeleniy Yar is a remote site near the Arctic Circle known to the indigenous Nenets people as “the end of the earth”. The unique site has revealed nearly a dozen mysterious mummies who appear to be foreign to the region, and whose artifacts can be traced back to ancient Persia, nearly 6,000 kilometres away. Scientists are undertaking genetic testing to determine the origins of the mummies and unlock the secrets of a mystery medieval civilization. 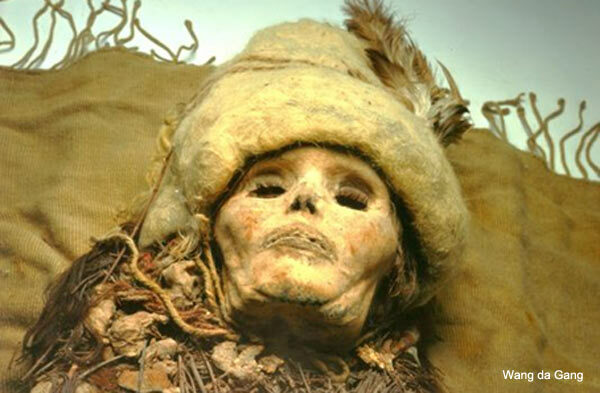 The mummies were found in a well-preserved state, seemingly by accident, and wearing copper masks and covered in reindeer, beaver, wolverine, or bear fur. Many of their skulls are shattered or missing, while the skeletons were smashed. 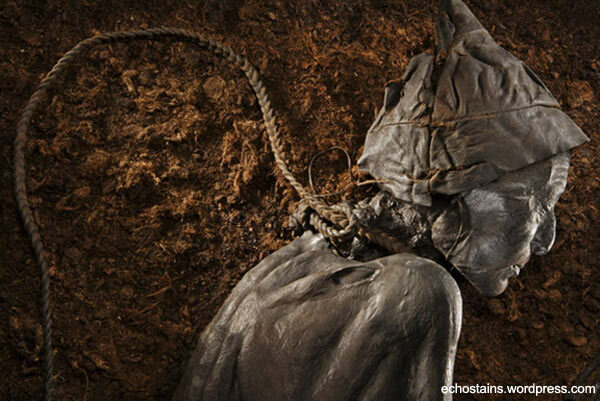 One of the mummies is a red-haired male, protected from chest to foot by copper plating. In his resting place, was an iron hatchet, furs, and a head buckle made of bronze depicting a bear.